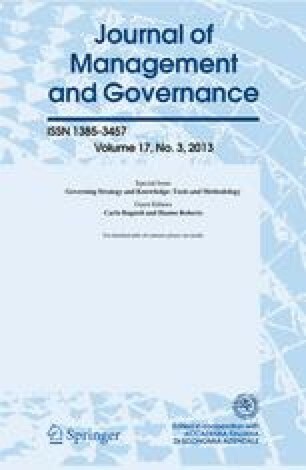 The aim of this paper was tomeasure the short-term perceptions of FinanceDirectors and how managers react to pressuresfrom the financial and corporate governancesystems in the management of R and Dexpenditure and innovation. The studyreplicates Demirag's U.K. study.Results do not support the proposition that thefinancial and governance systems behave in ashort-term manner in general. The bankingsystem in Italy tends to be neutral as regardsthe firm's decision making and management hasthe freedom to steer the firm forward in aframework of long-term profitability andgrowth. Italian firms are not perceived asbeing possible candidates for take-overoperations, which might exacerbate the problemof pressure to deliver short-term profits atthe expense of long-term R and D investments.However, in some sectors and under certain sizeand ownership structure conditions short-termpressures are felt more strongly: they aremainly science-based sectors as well as sometraditional sectors (engineering and constructions).In higher-pressured firms (HPFs) managementtends to place more emphasis on costs than onproduct innovation and is more likely to view Rand D as an overhead that has to be trimmedduring a recession. Moreover, the controlmechanisms tend toward short-term accountingmeasures. In addition, the prevalent sources ofshort-term pressures – where they are present– are interestingly different in Italy than inthe U.K.: while in the Anglo-Saxon context theyare perceived to come from the market andfinancial institutions, in Italy they areperceived to come from the firm ownersthemselves.